Bushey soldier pays tribute to a Jewish First World War officer. In August 2014, Diane Livesey, the great niece of Captain Fred Ward, brought his photograph and military details to the Bushey WW1 exhibition ‘A Village Remembers’, to enquire if he was the F Ward commemorated on the Bushey Memorial and at St James’ Parish Church. Members of our research team have confirmed that the F Ward on the memorials was her great uncle and that he lived with his wife and two young daughters at 56 Glencoe Road, Bushey in 1915. 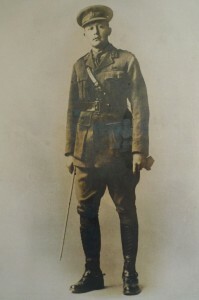 Captain Fred Ward won the Military Cross and was mentioned in despatches. He was killed in action in Palestine on 8 December 1917, aged 33. An article by Harold Pollins, ‘Jewish Officers in the First World War’, includes a letter written by Captain Fred Ward to the mother of a Jewish soldier under his command, while they were both serving in the 2nd/19th Battalion of the London Regiment. The Jewish soldier, Lieutenant Edwin Schonfield, was the son of Aaron and Amelia Schonfield of 10 Royal Crescent, Glasgow. He attended Hillhead High School before working in his father’s firm, Messrs A. Schonfield and Co., Iron Merchants. He was killed in action on 2 September 1916. Harold Pollins comments, ‘Tributes to Jewish officers and men who died were often written by Jewish ministers of religion and were sometimes accompanied by letters of praise from non-Jewish members of their unit. While those from Commanding Officers might be considered as standard letters of praise for courage and for duty well done, others (such as this one by Captain Fred Ward) appear to come from the heart’. I have had your boy with me for three months now. He is a terrible loss to me. My respect for him I cannot express, his cool enduring courage, his personal example and his ever-cheerful disposition, were to us such a blessing and an asset, we can never replace him. Mr. Harris of my company [probably 2nd Lt George Harris] has gone out to see him buried and make the best arrangements possible to fulfil the requirements of your religious faith. Mr. Harris is a Jewish soldier and a good fellow. I immediately wrote to the Jewish Chaplain of the Forces to officiate: fortunately he was in a town about five miles away. I have instructed Mr. Harris to do all he thinks you would require, also to arrange for a suitable tablet to be erected so that you will be able to make later arrangements. Pray, tell me if there is anything I can do for you, I am at your service. I cannot do too much for him, he has done so much for me. As one example of his unselfishness, he was good enough to allow me, though his junior, to supersede him. He then asked to come into my company.